Be the first to share your favorite memory, photo or story of Ralph . This memorial page is dedicated for family, friends and future generations to celebrate the life of their loved one. 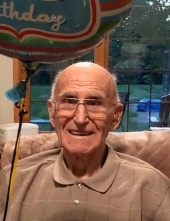 98, of Union Grove, died Monday, March 25, 2019 at his home. He was born July 7, 1920 in Prairie du Chien to Joseph and Albina (nee Mara) Novacek. He spent his early life in Prairie du Chien. On May 29, 1954 he married Ardelle Ann (Lietzke) Novacek in Hales Corners. In Ralph’s youth, he enjoyed trap shooting. Later on, he was in both golf and horseshoe leagues. He also enjoyed bowling and ended his career in May of 2018 at the age of 97. His highest game was 298! For the last three years of his wife Ardelle’s life, he gave her full care as she battled Parkinson’s Disease. A couple of years after Ardelle passed away, Ralph started volunteering to play his accordion at nursing homes and assisted living facilities. He put together songbooks that the residents used to sing along. Ralph shared his love of music by playing his accordion for over 10 years at 8 different local facilities. Ralph was a farmer until the age of 43 and a machinist of automotive parts at Walker Manufacturing for 14 years. He was a member of the Milwaukee Accordion Club, Grace Evangelical Lutheran Church of Racine and a former member of St. Paul’s Lutheran Church of Union Grove. He was a devoted husband, father and grandfather. Survivors include his children, Greg (Greta) Novacek of Wichita, KS, Connie (Mark) Roettgen of Trinidad, CO, and Lorie (Steve) Kanetzke of Racine, WI. grandchildren, Melissa Novacek, Sarah Novacek, Amy (Randy) Keith, Andrew (Claire) Roettgen, Ben (Amanda) Roettgen, and Christopher, Jeffrey, and Karina Kantzke, and great-grandchildren, Adeline and Stella Roettgen. Ralph is further survived by his nieces, nephews, other relatives and friends. Ralph was preceded in death by his wife, Ardelle Novacek, parents, Joseph and Albina Novacek, brothers, Leo, Sr. (Sylvia), Clarence (Clara), and Joseph (June). Memorials have been suggested to Grace Evangelical Lutheran Church of Racine and Ascension at Home Hospice. Special thank you to Ascension at Home for their care of Ralph over the past year. The family would like to especially thank his home care nurse, Cassandra, for her love and care since March of 2018. A visitation for Ralph will be held on Thursday, March 28, 2019 from 3 PM to 7PM at Polnasek-Daniels Funeral Home. Funeral services will be held Friday, March 29, 2019 at 10AM at Polnasek-Daniels Funeral Home. Burial will follow at Union Grove Cemetery. To send flowers or a remembrance gift to the family of Ralph T. Novacek, please visit our Tribute Store. "Email Address" would like to share the life celebration of Ralph T. Novacek. Click on the "link" to go to share a favorite memory or leave a condolence message for the family.